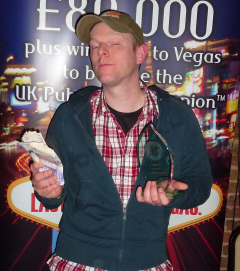 Our West London final saw the return of our 2011 national final runner up David Ansell. David made a good fist of trying to make a return next year but ultimately fell short in 37th position. A good result when you consider David started on table 1, which was named as the table of death by it’s residents due to the high number of eliminations. Elsewhere in the card room there was a guy named Peter Sharp who was sat there with 300 in chips and could perhaps be forgiven for turning his attention to his favourite Sunday night TV programs in front of the fire in his favourite armchair. Or to simply drown his sorrows in a London boozer. 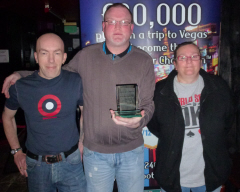 But maybe he had other ideas… The team event went to the Staff Club in Didcot and they were represented by league champion and finalist Darin Chapman, Anthony Davies and Sandy Budziszewski. Peter Sharp, our super short stack from earlier had somehow managed to amass 90,000 in chips, so put that pint on hold and Sky+ the X Factor as this guy wasn’t going anywhere. The top 7 were due to qualify for the national final, so it was perhaps apt that the 8th place finisher had already qualified for Nottingham next year. Once Kris Baron had been cruelly ‘rivered’ by a king and eliminated in 3rd place, we had a heads-up match on our hands. Peter Sharp, whose brother Doug has also finished 2nd twice before was up against Livvy Dawson from the Noble Vine. In what was Peter’s first final table, he went one better than his brother with an unlikely winning hand. Peter Sharp held a slight advantage pre-flop with 9-6 against Livvy’s 8-7. A final board of J-10-4-Q-5 gave Peter the victory which was effectively with 9 high!!! Congratulations to all winners and qualifiers.